Even though I'm no longer breastfeeding, I'm still happily wearing the maternity/nursing pieces I have in my wardrobe. The two blue tops below are perfect for breastfeeding. The blue tank is a specially designed nursing piece that I got while pregnant with Toddler T, and the wrap top is just a regular top I bought after Baby Boy was born. Both valuable pieces for breastfeeding, but also nice enough to wear afterwards! Despite loving blue and purple together, this is the first time I've worn this navy tank with the purple skinny jeans. I really liked the combination and I'm surprised I haven't worn it before. Nice and simple outfit for a morning at playgroup and then running errands in the afternoon. The Converse were great for all the running around I did! I'd forgotten that it was Superhero dress up day at daycare that week so I was that mum rushing around the stores in the afternoon trying to find super hero costumes! It seemed like everyone else had already done this a few days before as there were no little kids costumes to be found. Fortunately, a couple of masks and some superhero clothes the boys already had worked nicely for the day in the end. The silicone teething necklace and the purple skinny jeans match beautifully together, so this was a good outfit for the 'matchy matchy' style challenge on Instagram. It was nice to just wear a tank without a jacket - spring weather has been a little erratic lately but it's good to take advantage of warm days like this. The benefit of this tank and other specialised breastfeeding pieces that have hidden breastfeeding access is that you wouldn't know it was a breastfeeding top just by looking at it - definitely something that will stay in my wardrobe a long time! Last worn: Mothers en Vogue breastfeeding tank, purple skinny jeans, Converse, Rebecca Minkoff silver mini MAC. Other ways to wear: breastfeeding tank and maxi skirt, purple skinny jeans and graphic tee, Converse and a dress, Rebecca Minkoff silver mini MAC and printed shorts. Perfect for pregnancy: bubble tank in second trimester, purple skinny jeans in first trimester, Converse for second trimester travel, mini MAC and maternity shorts. Another breastfeeding friendly top, another pair of brightly coloured jeans. Unlike the tank above, this is just a regular wrap top that has the bonus of being perfect for breastfeeding in. And it's so soft and cosy. There might not be many more opportunities to wear it with our warmer spring weather having arrived, so it was good to get it out for another wear before I start to pack it and the rest of my winter things away. Just like the outfit above, I was surprised to find that I hadn't worn this wrap top with the red skinny jeans before, and loved wearing them together. Again, I wore this to meet the day's style challenge on Instagram. This top was perfect for the 'wrap star' theme! As I was wearing colourful clothes, I went with my usual fail-safe metallic silver accessories. 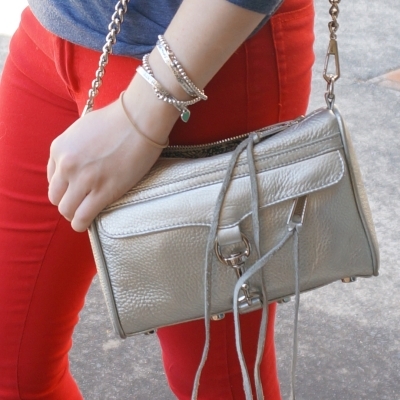 This silver mini MAC bag goes with everything, as do the metallic bow detail ballet flats. They often get worn together! Last worn: blue wrap top, red skinny jeans, silver ballet flats, Rebecca Minkoff mini MAC (above). Other ways to wear: blue wrap top and printed jeans, red skinny jeans and autumn layers, silver ballet flats and pencil skirt, Rebecca Minkoff mini MAC and maxi dress. Perfect for pregnancy: red jeans at 12 weeks, mini MAC and second trimester bump. You don't have to get rid of all your breastfeeding clothes once you're finished with breastfeeding! Specifically designed nursing tops with hidden access for breastfeeding look just like normal clothes and transition beautifully into your wardrobe for motherhood post-breastfeeding. Which is helpful at reducing cost per wear, considering they are usually quite expensive to buy! And of course wrap tops, v-necks and button ups continue to work in your wardrobe just like they did before breastfeeding. Linked up with Friday Favourites, Style Wise, Friday Faves, Shoe and Tell, Modest Monday, Mix It Monday, On Mondays We Link Up, Hello Monday, Mummy Monday. Yes it definitely impacts your fashion choices! Hi Mica! I love how you still find love and value in your clothing after breastfeeding. 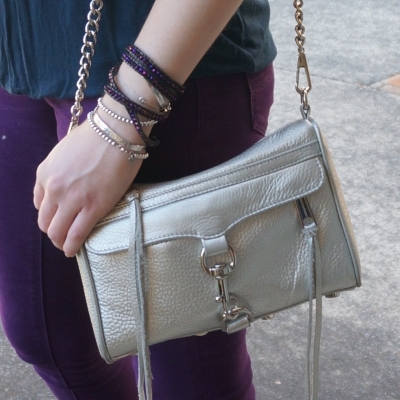 The color combinations are beautiful and the metallic bag compliment perfectly. I pray you have a wonderful rest of the week! I love how discreet these designs are, you can't even tell they're nursing pieces! The only nursing piece I've purchased so far is a bra, lol. I just wear tees and dresses that are easy when out with her, but I'll definitely have to invest in some pieces that are more practical. Thanks for sharing, girlie, and I hope you have a great weekend! Yes, you really don't need to splurge on expensive pieces! I found both these tops (particularly the top one) ideal for breastfeeding while baby wearing, wasn't as comfortable doing that in a tee. That's great that you're still getting use out of your breastfeeding tops, they're both really lovely. You always team your outfits together so nicely. I love your colorful jeans! I love your colored pants! The color combos you have chosen are excellent. I hope you have a great weekend and thanks for stopping by my blog. Love the blackberry skinny jeans! Your color combinations are always so pretty. Congrats on making the nursing- maternity wear clothes work so well for now! You look amazing! Love both of these posts your colorblocking is great! To look at them, you wouldnt even think they are breastfeeding tops. They look that good! Glad you can wear them after their purpose. Love that purple & navy together. Great necklace! Yes they are great to wear after as they are so subtle! That's awesome that you are still getting use out of your breastfeeding tops! And that teething necklace is super cute! Before or after great looks! Thanks for joining our Style Wise Link Up party! I hope you will join us next week! I love the blue and red combo! The necklace is so pretty! I love the colors in these looks, especially the first look--what a pretty combo! Yay for versatility--I love that you still wear maternity/breastfeeding friendly pieces even if you don't HAVE to anymore. I will soon be in the same boat... SO close to being done pumping. I am looking forward to more wardrobe versatility as well! Blue and purple looks great together!! I don't know why I haven't tried this combination before myself! I'm glad you've been able to extend your nursing clothes into post-nursing outfits and you styled them perfectly! I definitely do not miss those nursing days and to be honest I was so tired of the 5 nursing tops I had on constant rotation that I got rid of them. You've made a much better decision. I love the red jeans. It's fab you're still wearing the breastfeeding clothes, there's no point in throwing away perfectly good clothing! Fabulous idea! I love how functional these tops are but also totally in style - fashionable mommy wear at it's best! I like the wrap top! I won't need to think about maternity/nursing clothes for... quite some time yet, though it's always good to have pieces that can serve multiple purposes. Both tops are cute, and I really like your red jeans! These outfits are so cute! I'm loving the colorful jeans! I'm due in 2 weeks and have just started buying nursing tops. I cannot wait to start losing weight however, as I've put on 35kg+ in this pregnancy! I'm pretty much only buying basics right now to get me through, probably a bit frumpy to be honest as I'm hating on my body. I really should try and get a bit more confidence and try to look a bit nicer with matching pieces. I love what you're wearing though, will definitely be looking for a similar wrap top specifically! Oh Kel, you're growing a baby! It's hard work and it results in weight gain, don't ever feel bad for it! Basics you buy now I'm sure you'll continue to wear later - motherhood and pregnancy are hard work, be kind to yourself! Yes maternity jeans are the best! I was sad when my bump went away and I couldn't fill them out any longer! I love that second outfit. I've seen those jeans before and they are such a bright pop! You can rock them! Really simple but chic outfit!